Coloring Without Borders: Scotland's post-referendum politics: a "tectonic shift"? Scotland's post-referendum politics: a "tectonic shift"? On the one hand, nothing much has changed. On the other, Scottish politics are in uncharted waters. Last September, the people of Scotland voted in historic numbers and emphatically rejected independence from the United Kingdom. While 45% of the populace wanted independence, 55% percent of voters voted NO, we want to remain part of the U.K. The United Kingdom still reigns supreme over Scotland, one of its four nations. A poll from this past weekend, eight months later, shows 44% would now vote YES, 49% would vote NO, 5% are undecided, and 2% say "stop bothering me about this issue again, please go away". From that poll, you find a bit of movement but not really a "tectonic shift." More significantly, however, the Scottish National Party (SNP) fared amazingly well in the U.K.'s parliamentary elections a few weeks ago. Although the Tories surprisingly held onto power and now control the U.K. Parliament with a majority, in Scotland the SNP won 56 of 59 seats. The other three major parties — Tories, Labour, and Liberal Democrats — each won a single seat in Scotland. This dominance in Scotland effectively stripped Labour of a large number of Scottish seats, making them unable to gain a majority in the U.K. We all assume the SNP will be a significant thorn in the side of the governing Tories for years to come. The SNP already controls the Scottish Parliament and has a popular new leader in Nicola Sturgeon. Now it holds almost all the Scottish seats in the U.K. Parliament. Before the independence referendum last fall, the Tories, Labour, and Lib Dems promised significantly more powers for the Scottish Parliament. These promises of devolution helped turn the tide of the referendum and secure Scotland remaining in the U.K.
After the referendum David Cameron, the U.K.'s Prime Minister, set up the Scotland Devolution Commission to study the issue and make recommendations to the U.K. Parliament. The commission was led by Lord Smith of Kelvin, a self-made businessman from Glasgow made into a life peer by the Queen. Widely respected across the political parties, Lord Smith most recently served as the organizing chairman of the 2014 Commonwealth Games held in Glasgow. In November 2014 the Smith Commission, as it has become known, issued its recommendations. In general, the recommendations include more taxing and spending powers for the Scottish Parliament; letting 16 and 17 year olds vote in Scottish elections; allowing the Scottish Parliament more power over economic decisions such as oil and gas extraction; and sundry other smaller issues. The commission also recommended that the devolution of powers include language stating that the Scottish Parliament is a permanent institution. Most significantly, all of the political parties agreed upon the Smith Commission recommendations. Thus, the SNP signed off and agreed to these devolved powers . . . and their limits. The Queen's Speech earlier this week — in which the Queen essentially reads the legislative plan of the governing party to Parliament — indicated the Tories will follow the Smith Commission's recommendations. They seek to devolve to the Scottish parliament power over roughly 40% of taxes and 60% of spending in Scotland. But after their near sweep of Scottish seats in the U.K.'s parliamentary elections earlier this month, the SNP is emboldened. Claiming their strong showing in the election has "changed everything," the SNP now rumbles about how the Smith Commission should be a starting point and not an end point. Their new leader in Parliament, Angus Robertson, declared the U.K. government must "react positively to proposals for a transfer of powers beyond" the Smith Commission. According to Robertson, the Scottish electorate gave "overwhelming support in the election" to greater powers for Scotland. 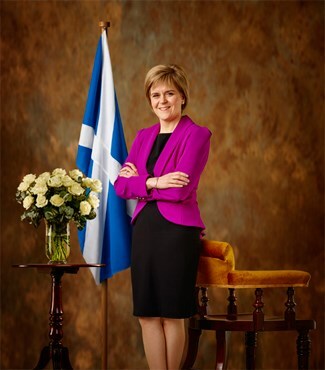 Nicola Sturgeon, the overall leader of the SNP and the First Minister in Scotland's parliament, declared that the U.K. parliamentary election demonstrated the "tectonic plates" of Scottish politics had shifted. The SNP has now floated the idea of a new independence referendum in the near future. That's right, less than a year after the last referendum, they want another one. At the time of the independence referendum last fall, the SNP declared it a "once in a generation" event. Sturgeon indicates this new referendum, however, could happen as soon as 2016. Another referendum so soon puts Scottish politics into the quandary of a "neverendum." The issue is unlikely to pass (at least according to current polls), but it lingers as significant motivation for the governing party in Scotland and its energized supporters. Almost half of Scots want independence, and those supporters are comprised primarily of the young and middle-aged; only the above-60 group votes in significant numbers against independence. Independence is the framework which likely will color all issues, and perhaps dominate them, for many more years of Scottish politics. Although only the U.K. government has the power to grant permission for a true referendum, the SNP says Scotland could vote on a non-binding resolution showing the will of the Scottish people. If such a resolution passed, the SNP claims the U.K. government would have to recognize Scotland's desire for independence and therefore hold a binding referendum. Again. No matter what the U.K. government decides with regard to devolution, the SNP will find a way to be disgruntled. Scottish independence is its raison d'être. To the SNP, the current devolution is just one step toward full independence. They'd love to skip over the small steps to a big bang of independence. It'll only happen, though, if or when the tectonic plates have shifted far enough. Want to know more about Scottish independence? Independence voters are . . . passionate.